Mitch Landrieu is closing out his mayoral term by letting the city know that the agency he heads is a complete disaster. This should come as a shock to no one. The city utility has been a disaster for a long time, and Landrieu’s term has been no exception. Meanwhile, Mitch obsessed over removing nationally recognized historic landmarks. Mitch wrote a book about himself. He performed the narration for the audio version of his book. Mitch has jumped at every opportunity to get on national media outlets to discuss monuments. He has traveled all over the country to talk about erasing New Orleans history. He went on a national book tour. All while collecting a check as active mayor of New Orleans. When it comes to failings and neglect of the city’s water, waste, and drainage utility, some specific instances jump out. “The city was going to flood anyway from this particular event,” Landrieu told reporters two days after the August 5th flood. Which was two weeks after a similar flood on July 22nd. Mitch was absent for the August 5th flood. He was attending an event at the Aspen Institute and that he was “obligated to speak.” A records request revealed Mitch’s staff urged him to return. But his Aspen speech was a higher priority than the flooded-out city he runs. “I made the determination not to come back because based on the information I had,” Landrieu said on August 24th. New Orleans flooded Saturday, August 5th. Mitch’s speech in Aspen was Sunday night. He returned to New Orleans on Monday, August 6th. And as of Sunday, August 13th, Mitch still had not reviewed the pump station logs from August 5th. $1.04 million of public money on other related costs, including the bills for New Orleans police, firefighters and Emergency Medical Services personnel to be present at the removals and at a massive protest at the Lee statue at Lee Circle. $710,000 to Trident Response Group, a Dallas-based private security firm that provided “threat assessments,” public safety plans and analysis that included undercover work infiltrating groups on both sides of the issue as well as intelligence gathering through social media monitoring and other methods. $113,400 to NOPD in overtime and $106,500 in regular time, in addition to other compensation such as time off, for a total of more than 10,515 hours of work on the removals. $16,720 was spent to pay other city workers and for other costs, including providing meals to city employees during the daylong removal of the Lee statue. $64,500 building and providing security for a shed at the Alvar Street storage yard where some of the monuments are being kept. These could have been funds, employees, and consultants to get the drainage system in decent shape before Mitch left office. But instead the money and city resources were spent tearing down the city’s historic landscape. While distracted with national conferences on foreign policy and his climate change initiatives, and interviews, and the monuments, citizens had to assume Landrieu would, at the very least, keep an eye on his always plagued utility: the S&WB and its ongoing failure to keep floodwaters out of taxpayers’ homes. Mitch’s response to criticism about his focus at the 2015 Council Meeting was, “Smart people can do more than one thing at a time.” That does not appear to be true for Mitch. Pump stations out of commission, unknown to the administration until citizens and reporters forced the issue. Three turbines out of service two weeks after a major flood, causing another major flood. Wasted millions refurbishing a 50 year old turbine instead of replacing it. Ignored Turbine No. 4 being out of service since 2012. Exaggerated a fire at a pump station. Employees missing from pump stations during flooding, again, unknown to Mitch until people and media repeatedly pushed the topic. Two major city floods from summer rains, not hurricanes. Thousands of clogged catch basins. Failure to use funding allocated specifically for catch basin maintenance. S&WB employees using fake handicapped park passes, and not paying parking meters. Dozens and dozens of boil water advisories. Leaking subsurface waterlines all over the city. Iced roads during winter freeze due largely to leaking city waterlines. As mayor, Mitch Landrieu is by default and obligation the president of the Sewerage & Water Board of Directors. This is one of the basic responsibilities of the mayor of New Orleans. This position unquestionably belongs to the mayor. Yet Landrieu did not attend a S&WB meeting from at least January 2014 until the Aug. 5 flood, minutes show. Mitch Landrieu has not simply neglected, he has ignored the drainage needs of New Orleans for eight years. The damage from Mitch’s neglect of his actual civic duties as mayor is largely immeasurable. However, the price tag that accompanies repairing the S&WB is measurable at $2 billion. Keep in mind, Mitch is a pathetic and deceptive estimator. For two years Mitch claimed the four monument removals would cost $175,000. When the City released numbers, they admitted to it being $2.1m. That figure excludes salaries of people like the mayor, his communications team, City attorneys, New Orleans Fire Department employees who removed the monuments, etc. etc. The condition of New Orleans’ infrastructure is deplorable. Drive through Lakeview. Look at Municipal Auditorium. The city-owned Lakefront Harbor. Mitch frequently talks about how he led the Katrina recovery. Even if he was correct—which he’s not because he took office five years after the storm—he failed to leave the city in a better shape than what he inherited 8 years ago. The S&WB “would be my No. 1 priority if my term were not ending in 21 days,” Landrieu said Wednesday. Mitch Landrieu has been the president of the Sewerage & Water Board for 8 years. Remarkably he did nothing in that time until he was put in a corner. Now he’s placing this disaster on the next mayor. Mitch has wronged New Orleans for 8 years, this is a kick to the ribs as he leaves the ring. 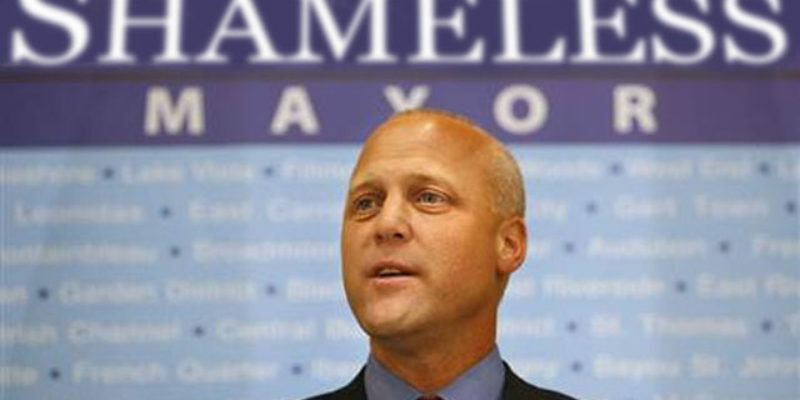 By and large, the mayoral legacy of Mitch Landrieu is failure and neglect.